July 3, 2011 by rwb, under Microcontroller. One of the advantages with the open source software and hardware such as Arduino (based on Atmel 8-bit AVR ATMega328 microcontroller) is the enormous “add-on” hardware called “Arduino Shield” that we could easily expand the Arduino main board and turn it into many cool and useful embedded system applications e.g. DC motor controller, web server, wireless application, GSM/GPRS modem and many more. The Arduino framework is so popular that many vendors come with their new Arduino shield module design almost every year. The enormous variety of the Arduino shield hardware in the market also trigger other vendor to take advantage of this condition and start to make their own “Arduino like” main board using other type of microcontroller such as Microchip PIC 8-bits PIC18F25K20 microcontroller (Amicus18), Atmel 32-bit ARM7 AT91SAM7X512 microcontroller (netduino), STMicroelectronics 32-bits ARM Cortex M3 STM32F103RB microcontroller (Leaf Maple), NXP 32-bits ARM7 LPC2387 microcontroller (FEZ Panda), etc. But unfortunately there is one “hick-up” on the Arduino main board design, at a glimpse you will think that this Arduino shield hardware will perfectly feed on the standard prototype board or breadboard,… hmmm… you could clearly see from this picture bellow that the digital I/O port’s gaps (J1 and J3 also called digital 1 and digital 2) in the Arduino main board is deliberately not designed for this purpose in mind. On the contrary the analog (J2) and POWER ports meets the standard gap width. 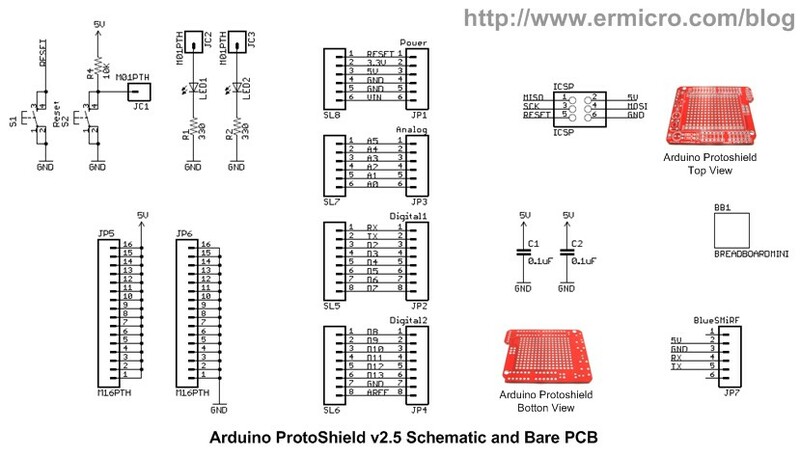 This mean we could not use and plug any standard Arduino shield hardware directly into the prototype board. As good electronics hobbyists this “hick-up” will not prevent us to take advantage of this useful Arduino Shield stuff out there, therefore I used the Sparkfun Arduino ProtoShield board design and turn it into the Arduino Shield Cradle so we could use this Arduino shield with other development board as well. 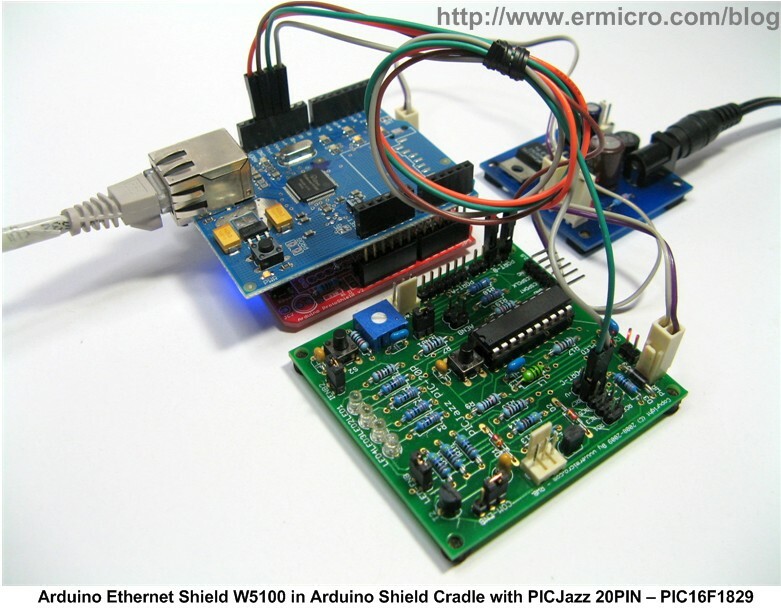 At the end of this tutorial I will present a simple Arduino Shield Cradle tester project using the standard Arduino EtherShield (with Wiznet W5100 chip) connected to PICJazz 20PIN board running Microchip PIC16F1829 microcontroller and run a simple ICMP (Internet Control Message Protocol) test over the Ethernet connection. Instead of making our own Arduino Shield Cradle PCB design it is easier to make used of what is already available in the market, therefore I choose the Sparkfun Arduino ProtoShield Board v2.5 design and with just adding a few electronic parts we could have a nice Arduino Shield Cradle that could be used with any Arduino Shield hardware. 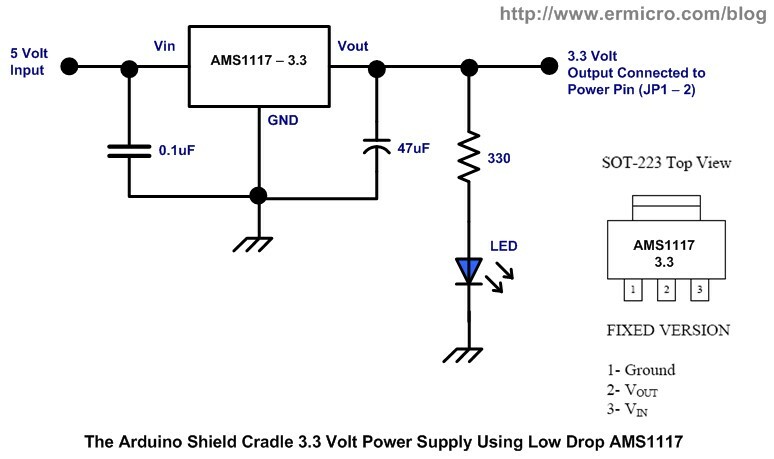 This Arduino Shield Cradle also is equipped with a build-in 3.3 volt voltage regulator using Advanced Monolithic Systems AMS1117 low drop voltage regulator chip. 14. 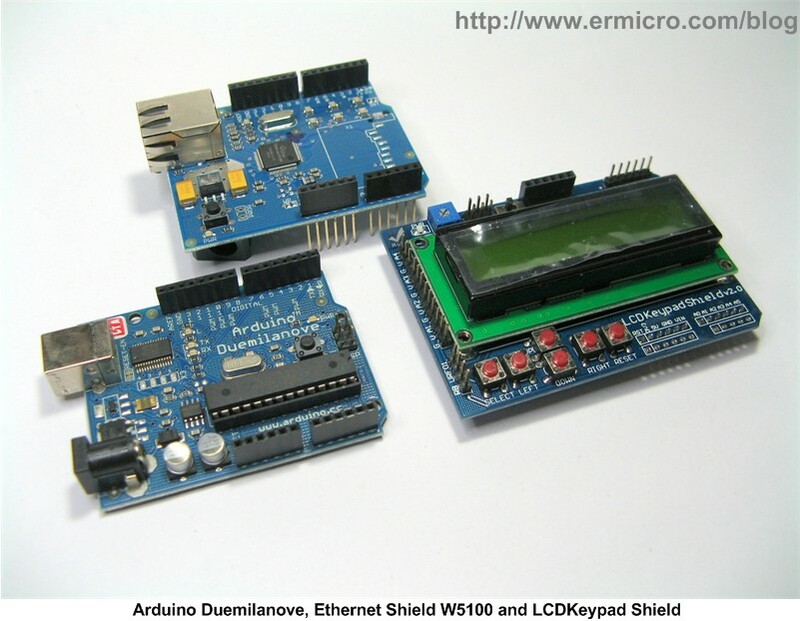 Reference Document: Microchip PIC16F1829 datasheet, Arduino Ethernet Shield W5100 datasheet, Wiznet W5100 datasheet, and Arduino Board datasheet. The following pictures show of how I constructed this Arduino Shield Cradle using the Sparkfun Arduino ProtoShield board design. As you could see from the Arduino Shield Cradle assembly above, you only need a view jumper to connect all the required electronic parts because I make used of the available PCB design connection. For example I placed the 47 uF capacitor on the S2 switch; 0.1uF capacitor on ICSP connector; I make used of the Arduino ProtoShield board LED2 with R2 (330 Ohm) as the AMS1117 3.3 volt indicator and the BlueSMiRF connector for the Arduino Shield Cradle board 5 volt power terminal. 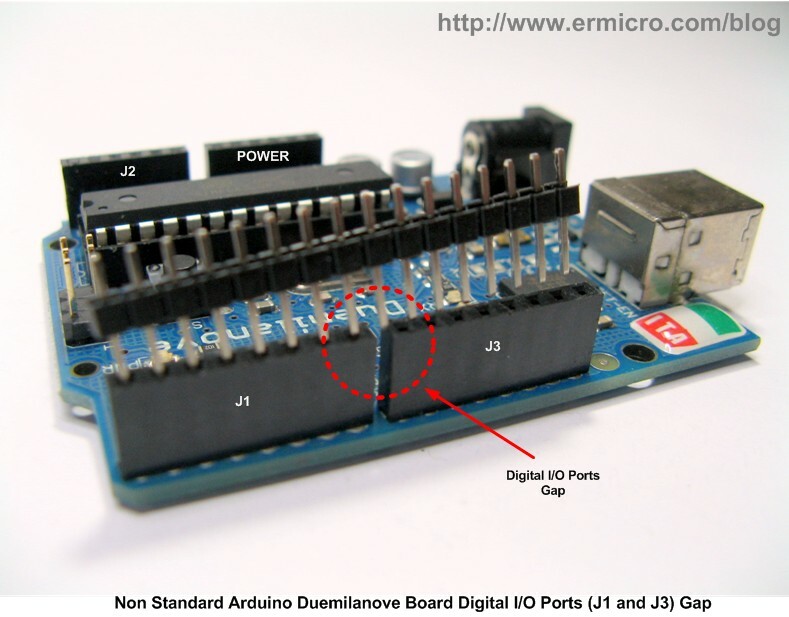 At the bottom you only need one jumper to connect the AMS1117 Vout (3.3 volt) to pin 2 on the Arduino ProtoShield board JP1 (Power Pin). 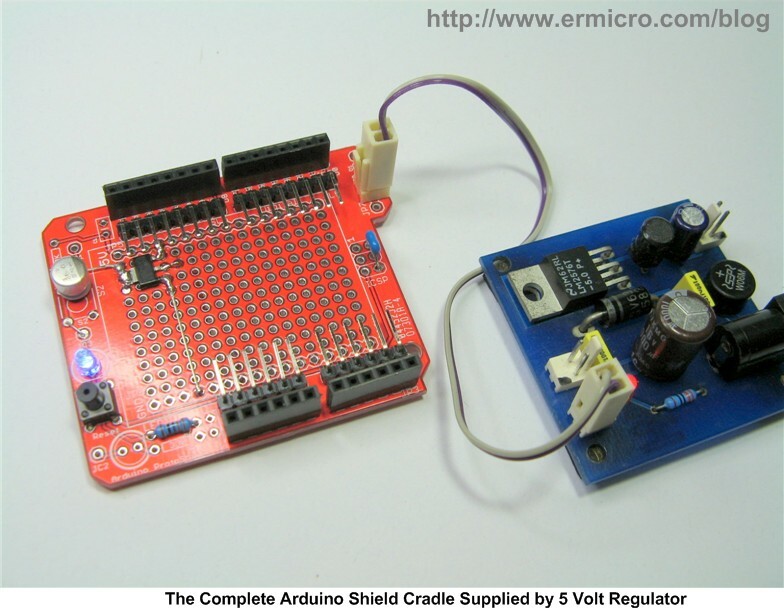 The following picture show the complete Arduino Shield Cradle tested with the 5 Volt voltage regulators. 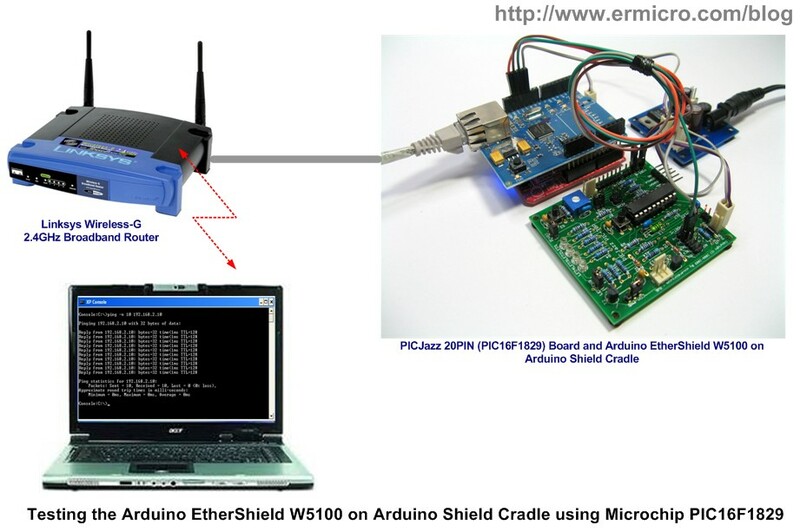 Of course this project is not complete without testing our Arduino Shield Cradle, therefore to make it more interesting I used the Arduino Ethernet Shield W5100 as our target hardware shield to test this Arduino Shiled Cradle. This time I used one of the Microchip 20 pin 8-bit newest and powerful midrange PIC16F1829 microcontroller with PICJazz 20PIN development board. 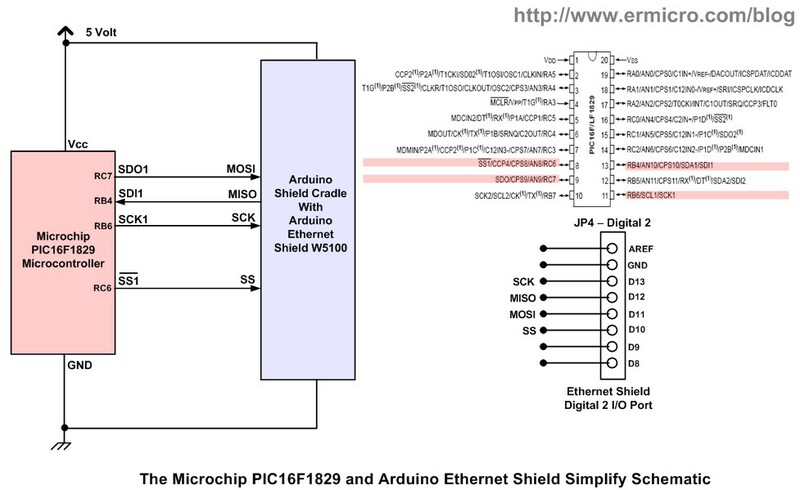 The Microchip PIC16F1829 microcontroller could be considered as the product that fills the gap between the PIC16F midrange and the PIC18F high-end series. It’s equipped with many peripherals that before only could be found on the PIC18F high-end series such as In-Circuit Debug (ICD) via Two Pins, Internal temperature Sensor, 5 Timers, Two Enhanced CCP (ECCP) Modules, Two Master Synchronous Serial Port (MSSP) with SPI (Serial Peripheral Interface) and I2C (read I square C), and mTouch Sensing Oscillator Module. 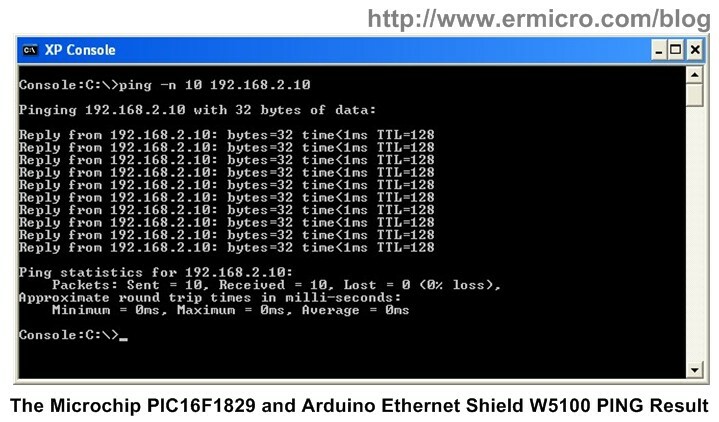 On this tutorial I will use the PIC16F1829 SPI peripheral to communicate with the Arduino Ethernet Shield W5100. Basically the Wiznet W5100 (used in standard Arduino Ethernet Shield) implements a full-featured of standard IEEE 802.3 (Ethernet physical and data link layer) and powerful TCP/IP stack inside the chip; this make the Wiznet W5100 chip is a nature choice for integrating the embedded system into the internet. // 0.16% Error for 8 MHz Oscilator Clock. Actual Rate will be 19231. After compiling and downloading the HEX program into the PICJazz 20PIN board; connect the RJ45 connector UTP ethernet cable to your hubs/switch or you could connect directly with the cross configuration cable to your computer. Use the serial terminal such as Hyperterminal, puTTY or Tera Term and configure it to accept the serial connection with 19200 baud rate, 8-bit data with No Parity Check. 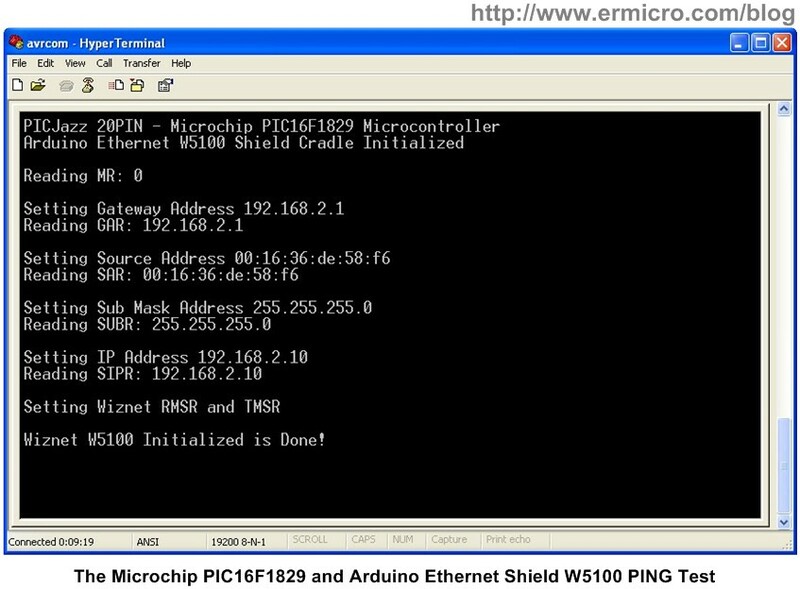 You could read detail information of how to use the Wiznet W5100 chip on “Integrating Wiznet W5100, WIZ811MJ network module with Atmel AVR Microcontroller” and using Microchip PIC microcontroller SPI (Serial Peripheral Interface) on “Using Serial Peripheral Interface (SPI) with Microchip PIC18 Families Microcontroller” articles. One of the Arduino framework successful stories is come from the various well designs Arduino Shield hardware available on the market, which could bring broader range of various embedded application that could be applied with the Arduino board. 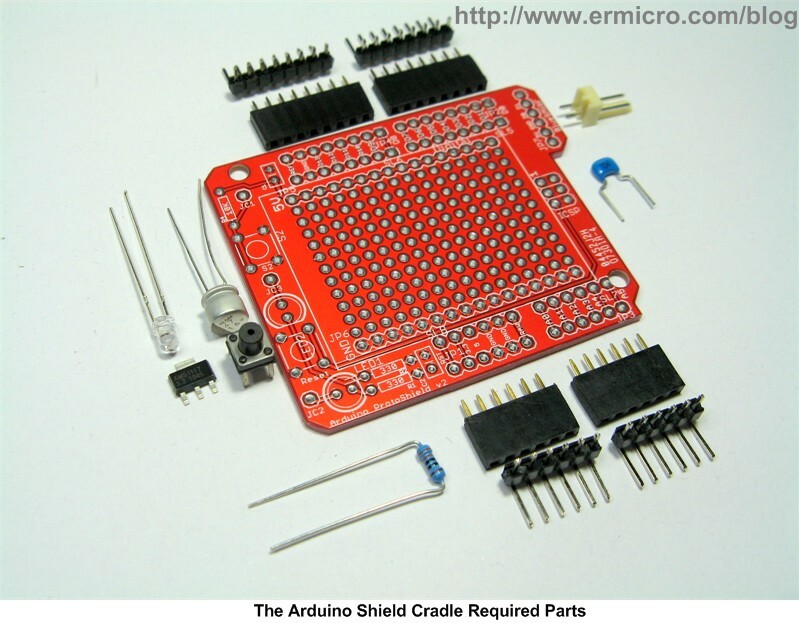 Now with the Arduino Shield Cradle in your hand you could easily use these various shields on any development board or microcontroller type in your next embedded application project.